This is the site of the buffalo Central Terminal. Built in the early part of the 20th century it was to be the grandest railway station of it’s type in the United States. It was completed in June of 1929 four months prior to the 29’ stock market crash. During the ensuing depression the station was abandoned and became derelict. The 17-story Art Deco style station was designed by architects Fellheimer & Wagner but many believe that Paul Omphalos may have had an unaccredited hand in the design. While there has been no official activity in the building for a number of years some believe that it has been used for various covert uses. In the last 50 years it has quietly changed ownership numerous times but the owners have been very secretive. 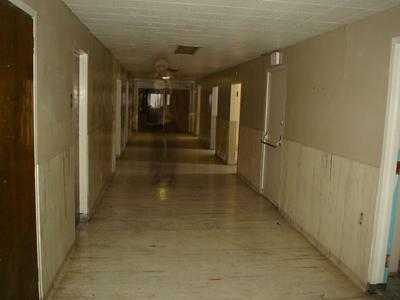 In the fifties it was rumored to have been used by the US Army as a research / asylum for explorations into the paranormal. Some believe that it is still used for the same purposes today. Visual: apparitions, lights turning on and off [strange since the electricity has been cut of from the location since 1973]. Then there’s the story of Judy White, who went to spend the night there on a dare in the summer of 1987. She died that night on the site. Coroner reports faulted an undetected heart defect, but the question remains: what did she see or hear that caused her heart attack? Since that event, visitors have claimed to hear Judy calling out for her friends, telling them she’s lost and can not find a way out. There was a fire in the West wing of the facility in 1937 – 12 inmates died when the staff could not open their ward. A nurse was also trapped inside and perished. No explanation as to why she was on the wrong side of the locked door. This could account for some of the screams and smells of burning that have been reported in that area. Another interesting rumour is that a group of physicians working there were part of an occult group that held rituals on the grounds. Some of the stories go so far as to say patients – deceased or otherwise – were used in these rituals or for sacrificial purposes. Visitors have reported seeing non-human apparitions or figures. An illegal party was held there on Dec. 31, 1999. There were 17 ODs that night – 3 resulted in death, and 4 more had to be institutionalized indefinitely. So many have snuck onto the grounds to try have a supernatural encounter – and so many have been injured or traumatized by their experiences there -that local police have gone so far as issue public warnings to avoid entering the premises or face trespassing charges. There is an ongoing effort to have the site condemned and razed.